I HAVE TRIED THIS ON SEVERAL GUNS AND WILL FIT JUST ABOUT ALL SO FAR. AUTOS & REVOLVERS. I PURCHASED THESE THROUGH A MILITARY SURPLUS AUCTION. 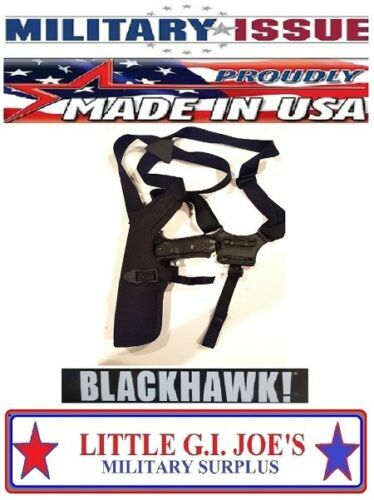 The Blackhawk Vertical Shoulder Holster carries with exceptional concealment comfort and will securely retain your firearm. The cordura nylon outer shell provides the comfort needed to wear it for long periods of time, and the waterproof closed-cell foam padding ensures protection for a variety of environments and circumstances. It comes with an offsite tie-down with a dual Picatinny rail platform that works as a great place to secure additional accessories. The adjustable non-stretch finger break and retention straps work with a variety of pistol sizes. The nylon vertical shell provides great concealment, comfort and retention for your firearm. 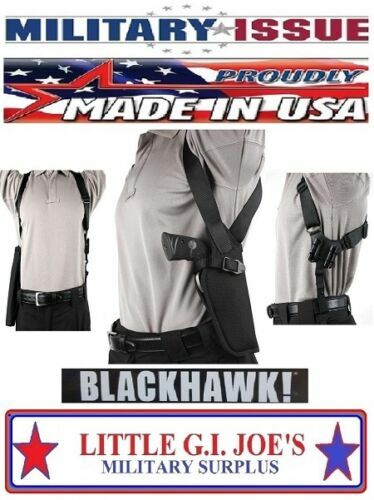 The holster is a dependable product made in the USA.